Like the previous week in Galle, it was rainy and overcast in Nuwara Eliya a few days back. But it didn’t deter me from visiting the cool environment, green atmosphere and lovely mist laden Galwaysland National Park. “It has 73 acres”, according to instructor of the Gallwaysland National Park, R.A. Amarasinghe who was accompanying me. I started my forest trail breathing in the lovely fresh air. Gallswayland National Park is located about 2km away from the Nuwara Eliya town and is the second highest positioned national park in the country. It was declared a nature sanctuary in 1938. Due to having high biodiversity again in 2006 part of this land, 29 ha had been upgraded as a national park. This small patch of land is a very good model to mountain forest type and its habitat type. Here I saw both native and introduced floral species. The area was known for giving good habitat for some interesting mountain fauna species too. The entrance of the cross shaped roller gate made of wood is the first sight you get of this place. 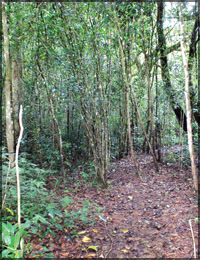 Much of the fauna and flora can be seen just a few metres of the trail. Gallswayland National Park is a beautiful gift of nature. The park provides a serene and cold atmosphere with picturesque beauty complemented by its huge trees. The natural beauty of birds, butterflies and wild animals running across the forest and on the huge trees was indeed a sight to behold. The park was declared a national park on 18th May 2006 by the Department of Wildlife Conservation. It was opened to the public on 7th April 2007. During the period of British rule the surveyor’s assistant’s name was Gallways. He bought this forest. Since that time this forest had been named after him. “The season favourable for visiting this forest is from April to August. People who visit Horton Plains can visit the Gallwaysland first, because Gallways forest can be a very good information centre for them. Incidentally there is a fine of Rs 150,000 to those caught illegally entering this forest by the Department of Wildlife Conservation” said Indika Galpatha, Park Owner of the Gallwaysland National Park. The Gallwaysland National Park may be described either as a rain forest or wet evergreen forest. The average height of the trees vary between 25m, 35m. Some individuals rise even up to 40m too. 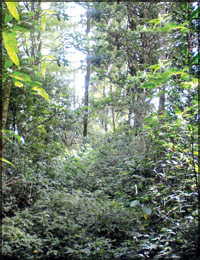 Ginihota (Cyathea spp), keena (Calophyllum spp), damba (Syzygium assimilae) and wal sapu (Michelia nilagirica) are in this forest among other trees. Studies on the fauna of Gallways will provide visitors various kinds of butterflies, reptiles, birds, mammals. Also you can see wal wura (Sus scrofa), weli muwa (Muntiacuc muntjak malabaricus), handun diviya (Felis vivervinas) , kalu wandura (Trachypithecus vetulus), dandu lena (Ratufa macroura) and rabbits. Gallwaysland National Park is absolutely beautiful. This park is definitely worth spending some time at. You could get in a hike in an hour or two or spend a whole day there exploring and enjoying the beauty. Admission is Rs 30 for adults, Rs 20 for a child and Rs 5 for school children. It is desirable that you, who visit the forest, be sensitive to the need to conserve forests such as Gallwaysland. In addition man finds peace and tranquillity in a forest. You can enjoy its beauty and majesty whether you be a photographer, artist, scientist or a nature lover. Please do not leave behind polythene or plastic which you bring. We must protect this natural beauty of our motherland for others too to enjoy. 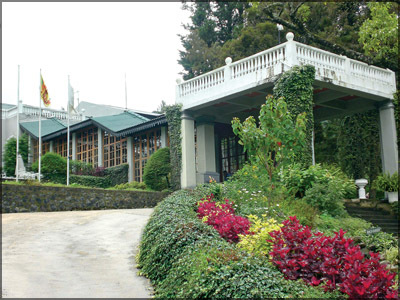 Perched 6182 ft above sea level amidst the mist shrouded mountain peaks in Sri Lanka’s cool tea country, St. Andrew’s Nuwara Eliya the colonial residence is over a hundred years and still retains the pace and style of life from that early era. On my way to the tea estate, tea pluckers, vegetable gardens, mountain peaks, flowers, clouds and lovely mist captured my attention. These ‘teascapes’ would have probably been there for centuries. So I didn’t feel the distance of 179 km from Colombo to the hill country. Entering St. Andrew’s hotel’s ‘green’ atmosphere, cool environment and natural beauty was a blessing for me to spend a nice holiday. Documents regarding the property date back to 1875. It is said that the hotel is part of a land gifted to a faithful servant of the crown. A house was built on his land which later was known as the Scots Club. During the early 1900s the club became a hotel which was run by a German manager by the name of Humbert. In 1918 the hotel was bought by a syndicate headed by Arthur Ephraums. In November 1919, J.H de Zilva, a young cousin of Ephraums was appointed manager. After a long line of the ownership St Andrew’s was added to the Jetwing group in 1986. St Andrew’s has its own vegetable garden which has various vegetables such as carrot, beet, beans, broccoli and cabbage, as well as herbals such as horse mint, peppermint, coriander, mint, parsley. If you want to add these to your meal you can pick your own vegetables or perhaps enjoy a fresh garden salad like I did. Really, it was a unique experience. There are no chemicals and it is a blessing, like their meaningfully said “Ayubowan”. They almost use their own garden vegetables for preparing meals. It is this uniqueness that I felt at this hotel. In addition St Andrew’s has a farm which has cows, goats and rabbits and a wetland where dragonflies and damselflies live. Further enhancement of this wetland environment will encourage increased habitation by dragonflies and damselflies and thus help preserve locally endangered species. The Hotel’s management hopes that this wetland area will serve as a role model to demonstrate that even small sites as this, if managed properly, can serve as important sanctuaries for Sri Lanka’s biodiversity. Dragonflies deliver the eggs at the shallow or deep level of the ponds. So different levels of ponds are created on this wetland. Sri Lanka white eye, dull blue fly catcher, Indian scimitar, yellow eared bul-bul and common trailer birds can be seen on this wetland. Destination Sri Lanka is named among Asia’s leading destinations; voted in by travel agents world-wide for the World Travel Awards 2008. Two of Sri Lanka’s entries are short listed for World Awards. Kumbuk River Sri Lanka, is nominated under World’s Leading Eco Lodge and Responsible Tourism Partnership Sri Lanka, is voted in under World’s Leading Responsible Tourism Scheme. Sri Lankan Airlines is among Asia’s Leading Airlines and Ayurveda Pavillion is voted in under the categories Asia’s Leading Resort and Asia’s Leading Spa Resort.